Every time I sat down to blog during the month of April, something drew me away from my computer. 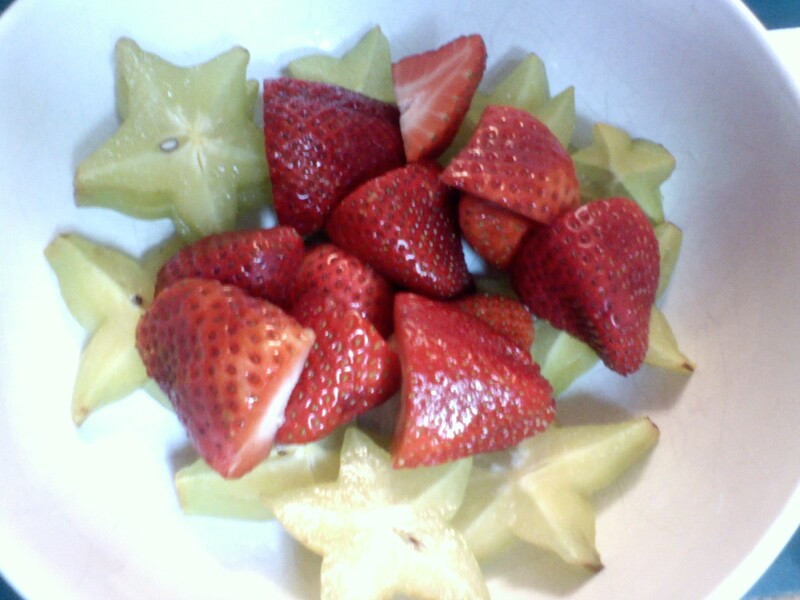 A strawberry and starfruit salad. There was a solid week of both Starkitten and Sunfilly needing my attention with every waking moment, because they missed their father and their old home in Dallas. I’d also had a few job interviews to survive, my best friend’s wedding to attend, and I picked up a temporary legal job called document review (which ended on Cinco de Mayo) in Dallas. I had started running/walking a 5k with the kids and my brother during the times I was in East Texas. I rejoiced in the rainstorms that quenched a Texas still recovering from a nightmarish drought, and I rejoiced even more when I learned that the 15 tornadoes that touched down in Dallas claimed not even a single human life. 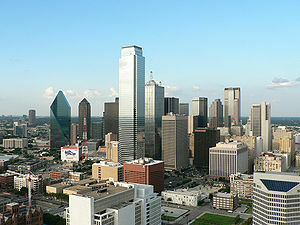 I explored downtown Little Rock and became reacquainted with downtown Dallas. I have been tending my little flowerpot garden. I colored eggs with the kids for Easter and made fruit salads with strange new fruits like starfruits and pommelos and had a few heart attacks from Sunfilly’s daredevil stunts (and even an ER visit). And I wrote 40,000 words in a fiction novel I started when I arrived here in a flurry of depression-turned-to art; I think it took about three weeks to churn out that much that quickly. So, needless to say, April was a pretty busy month. I laughed when I realized this. The day before I had to start on my document review project (a term which lawyers often shorten to “doc review”), I stopped at a Wal-Mart to pick up non-perishable lunch and snack items and cheap portable toiletries. So I filled up my shopping cart with Easy Mac, cups of ramen, trail mix, and other sure-to-give-you-cancer fare. I was wearing a shirt I’d picked up at my 10-year high school reunion. Both the cashier and the man behind me in the grocery line asked whether I was in college. Since I no longer had my cute little condo in Dallas, I slept on a friend’s couch while I was working doc review. I had no car, so I took the bus or hitched a ride with my friend, who worked a couple blocks away from where I did. I worked 12- to 15-hour days. My iPod became the key component to my sanity. I kept a book in my purse… just in case I had 5 minutes to read. Happy hour was a must, when I had time for it. It really felt like I was back in college. (In case you were wondering, my parents were watching the kids while I was in Dallas). 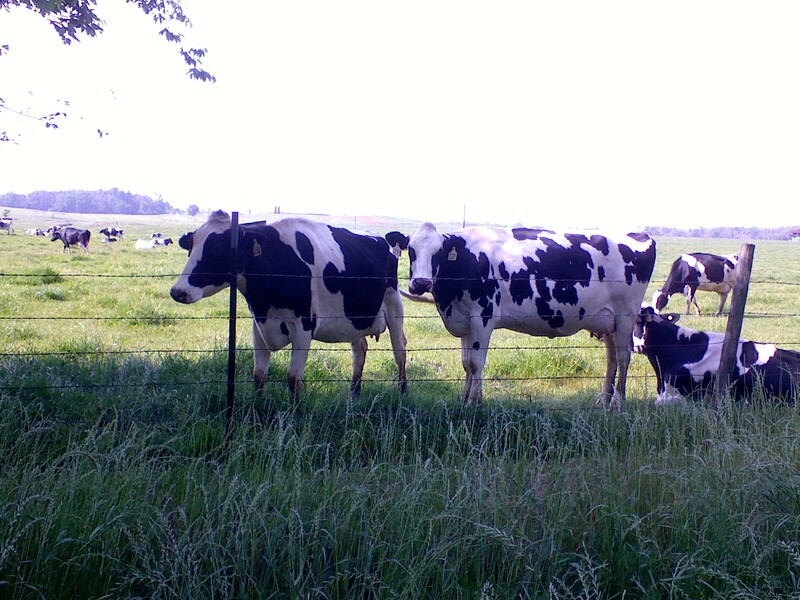 Some friendly cows. The local rancher raises dairy and beef cows without hormones or antibiotics and will humanely butcher and sell the beef to interested buyers. Since my parents’ home is out in the middle of nowhere, it’s easy to feel isolated. But sometimes the solitude that comes with living in the country is the best medicine for a broken heart and/or broken spirits. The little road here runs through an idyllic countryside. It’s tree-lined and it has the perfect blend of cozy little houses and vast expanses of pasture. It flows with the land, rising and falling, curving around hills, crossing creeks at their most melodic points. About 1.75 miles down the road from the house you can find a trailer where an elderly Mexican woman sells some of the best tacos I’ve ever had. So my brother, the kids, and I began walking/jogging down the country road. We’d stop at the little store for tacos and gatorades and then head back. As usual, I tried to make it educational for the kids. I taught them to recognize certain birds by their calls. How to tell a young horse from an older one, or how to tell a milk cow from a beef cow. We’d catch lizards along the road, learn their names, and set them free. We’d see how many different wildflowers we could find, or forage for wild dewberries. We’d count slider turtles sunning themselves on logs in the creeks. We’d count cows, goats, and puppies. We became acquainted with people whose homes are along the little road, people whom my parents never got to know in their eight years of living in this house. The funny thing about this community in East Texas, I learned, is that it defies the stereotypes about this region. The East Texas stereotype is that people are ignorant, hateful towards those of different faiths (even Catholics are persecuted), in favor of Jim Crow laws and segregation, xenophobic, and trigger-happy. In some cases, that is true. In this community, people are much more welcoming, open to new things, and embrace a live-and-let live ideology. I learned that, although there are only a handful of black families here, the children were never labeled or singled out; in fact, two of them were valedictorians in their classes and one was a student body president (if you knew the kind of community I grew up in in Louisiana–where classes were still pretty much segregated at the turn of the millennium–you’d understand why this is really a big deal to me). The gay and lesbian kids and the atheists are also not singled out or harassed, not really. I learned that one transgendered boy (meaning s/he identified as a girl) was allowed to put her name on the ballot for homecoming queen–and nobody cared. And this is the heart of East Texas. So much for stereotypes! 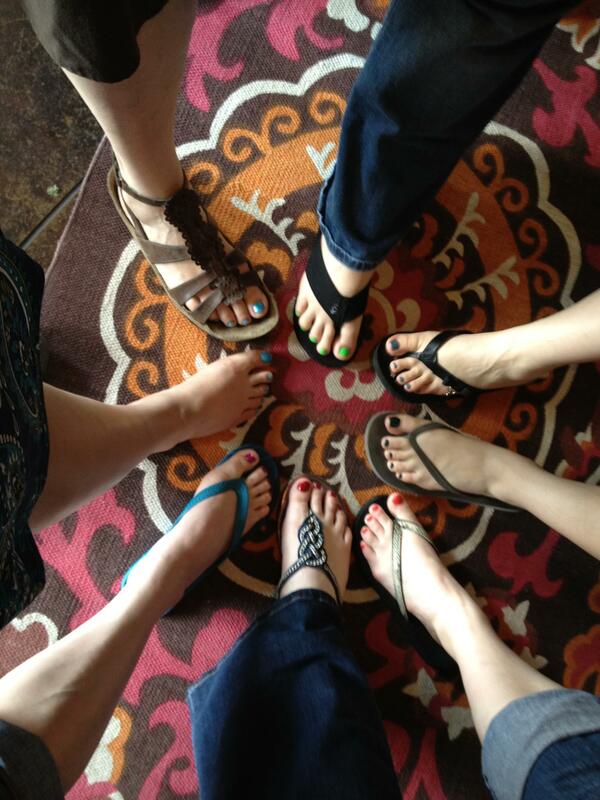 Flaunting our pedicures at the entry to Dizzy’s Gypsy Bistro. I actually have two really good friends who share the title of best friend. We’ve known each other since our first year of college and eventually became roomates/suitemates. We were the Trinity (I’m Jesus), the Three Musketeers (I’m Porthos), Kirk/Spock/McCoy (I’m Kirk), Harry/Ron/Hermione (I think I was Ron), and any other famous trio. Well one of the trio, whom we’d endearingly refer to as “Sparky the Holy Spirit,” tied the knot last month in a beautiful wedding in Little Rock. The reception was at a posh hotel. The bachelorette “party” was really a mani/pedi spa day, followed by lunch at a restaurant in Downtown Little Rock called Dizzy’s Gypsy Bistro (I had the black truffle ravioli and it was out of this world). During that weekend I also learned that downtown Little Rock has a fabulous little farmer’s market on its riverfront and a “natural” playground for kids, since it is the “Natural State.” The park is made up of local rocks, arranged so that there are walls to climb and tunnels to explore; it was a great way to wear out the kids. Starkitten was the flower girl at the wedding, and she was certainly adorable in her little dress. Despite being very shy, she walked down the aisle perfectly, only hiding her face once she was near the front and noticed all the cameras snapping. Sunfilly, who wore an identical dress, decided that she was a princess and the church was her castle. The comments she made regarding this were incredibly entertaining. I also learned that toddlers can be masters at terrible timing. At the reception, when the other part of the trinity, who served as the maid of honor, was about to give her speech, Starkitten told me she had to go potty… now. So I was forced to miss the one speech I’d been waiting to hear, but I heard later that it was a moving speech, all the same. Two days ago, the neighbors discovered a litter of shepherd puppies in the creek that runs through their property. This creek flows along the local highway before it turns into their property, and so, by the looks of things, it appears that someone dumped off the puppies at the side of the road (as what happens with tragic frequency in the country) and they got washed down the creek in the rain. The puppies didn’t seem that harmed by the water, but when the neighbors found them, they were being eaten by coyotes, so the neighbors chased off the coyotes and rescued the puppies. Yesterday, my parents went next door and adopted the little female, as female pups have a harder time finding a forever home and she was the spunkiest and had the brightest eyes. My girls were very excited to have a new puppy in the house, but my chihuahua, Skeeter, and my parents’ Australian shepherd mix, Myrtle, were none too happy about it and proceeded to sulk for the rest of the day. When we tried to name the little puppy, Starkitten vetoed every name we suggested, including: Ingrid, Astrid, Priscilla, Anastasia, Eunice, Princess, Duchess, and Baby (we do have a fondness for old-fashioned names for our dogs). Drusilla, it turns out, has chosen Starkitten as her human. She gets so excited whenever she sees Starkitten and follows her around the house everywhere. And she was apparently very distraught that Starkitten did not accompany her to the first veterinarian visit. The vet told my mother that Drusilla had worms, but otherwise a clean bill of health. He estimated that she was about six weeks old. We also discovered that Drusilla is, for the most part, housebroken–she cries when she wants to go outside, but when she is too busy playing, she won’t say anything. I’ve been charged with Drusilla’s training, with help from my mother, who is used to shepherd mixes. And Starkitten and Sunfilly are charged with running around outside with her. I intend to post pictures of little Dru as soon as I get a camera working again (I was using my camera phone, but that cell phone has since died). And then you can all bask in the adorableness that is Drusilla.